New look for F1 2009… and it’s ugly! The racing season maybe over for another year but Formula One never stops and with new rules being implemented for 2009, the first signs of the new look to the single-seater racing car have being unveiled during testing at Barcelona. In a bid to improve the spectacle and make overtaking easier, the sport’s governing body have drafted in a set of new aerodynamics regulations – as well as reintroducing slick tyres – to Formula One next year. 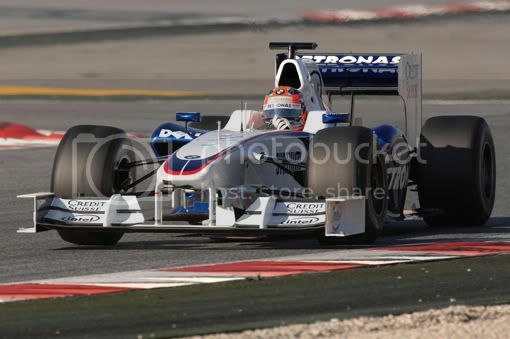 Williams was the first team to incorporate the new 2009-spec aero kit with a hybrid version of last year’s FW30. The front wing has been lowered in height and extended in width in a bid to get rid of the understeer effect when following another car. The driver can actually adjust the wing angle with a lever or switch inside the cockpit to change the level of downforce if needed. As for the rear wing, the increase in height and a reduction in the width will create more drag, so that the slipstream effect can be achieved. In addition, the level of grip has been reduced to make it more of a challenge for the driver. 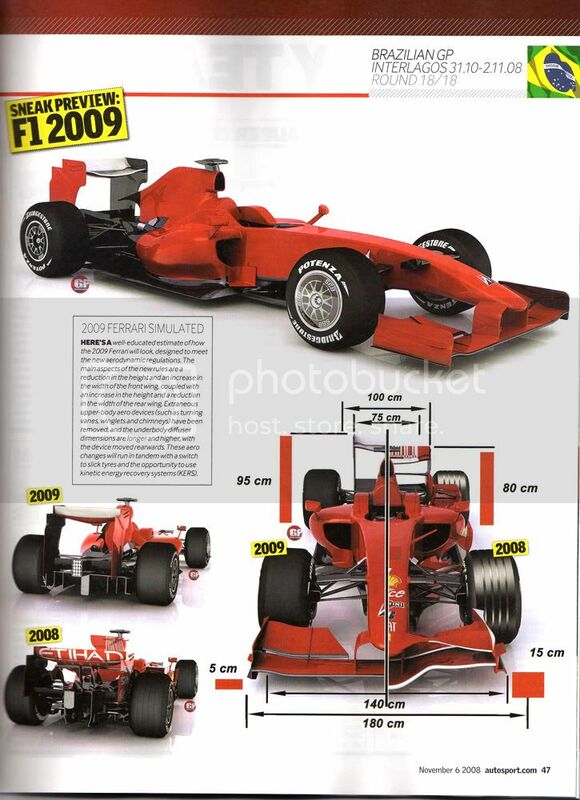 More on the 2009-aero spec can be seen in this detailed technical drawing taken from Autosport magazine (shown below). The mock-up of the Ferrari looks reasonable and in reality, the Willliams F1 car seems good. But prepare to be shocked with what BMW Sauber has come up with during the first week of testing at the Circuit de Catalunya. This hybrid BMW Sauber looks horrible! The front wing is out of proportion, no thanks to the retro-looking flat nose that magnifies the appalling mess… As for rear wing, it looks tiny when you view the Formula One car from the back. Sure, it is refreshing to see slick tyres back on a racing car after ten years running on grooves, but somehow the overall appearance is difficult to consume. Welcome back the all-America action hero that is Jack Bauer. Next week on Sky 1 (on November 24th no less!) a special two-hour prequel movie that bridges the gap between Days 6 and 7 of 24 returns to the screen. In 24: REDEMPTION we catch up with Jack Bauer (Kiefer Sutherland) on the African continent where he has sought solace in missionary work. He soon finds himself in the midst of a bloody uprising in the fictitious African nation of Sangala where a ruthless dictator is drafting innocent children to serve as soldiers in his army. As the vicious Colonel Dubaku (Hakeem Kae-Kazim) descends on an orphanage in search of recruits, Jack enters into a one-man crusade at the behest of his friend Carl Benton (Robert Carlyle) to rescue the children and get them to safety. Check out the new trailer and the behind-the-scene photographs to 24: REDEMPTION on the Sky 1 website. It all looks really exciting and I for one cannot wait for some Bauer action! As for the regular television series, read this full extract on what to expect in Day 7. WARNING: contains spoilers! It seems like it’s been about five years since we last caught up with 24’s Jack Bauer. When last we saw him, he was staring off into the distance at the very edge of a cliff… and has remained doing so since last winter’s writers strike delayed the start of 24’s Day Seven by a year. However, fans of 24 will get a glimpse into the life of Jack Bauer this fall when FOX airs the two-hour 24 prequel telefilm, 24: Exile, which follows Jack in Africa as he takes on the ripped-from-the-headlines issue of child soldiers. Fans at the 24 panel at Comic-Con were treated not only to 24: Exile’s trailer–which features lots of familiar faces including Kiefer Sutherland, Peter MacNicol, and Powers Boothe, but also first female president Cherry Jones, Jon Voight, Robert Carlisle, and Gil Bellows–but also to a look at a full scene from the prequel movie, in which Jack shepherds a group of African children to the US embassy but finds himself caught in a full-blown gunfight on a crowded street. In addition to the gunfire, it’s also a deeply emotional scene, in which Jack is forced to tell a sobbing African child that his beloved teacher, Mr. Benton, sacrificed himself in order to ensure their safety. As for the depth of Day Seven, we do know that it involves the first female president of the United States, who will be played by celebrated Broadway actress Cherry Jones, and the return of fan favourite character Tony Almeida (Carlos Bernard). So what does it mean that Tony has seemingly returned from the dead? Gordon joked that it “very well could be a measure of our desperation that he’s back,” and noted that on paper at least Tony had been killed four times over the series’ run. Producers David Fury and Manny Coto, however, refused to accept Tony’s final death (which seemed to be sticking), saying that they didn’t believe that Tony was dead; even Gordon admitted that he didn’t love the way that Tony had died. The secret behind Tony’s return will be a major component of Day Seven. Sutherland says the method by which he’s returned to the series is “so clever” and “very 24.” The back-story will be a function of how Tony didn’t actually die and what was done behind people’s backs in order to secretly keep him alive and fake his death. “I think the writers did an amazing job,” said Sutherland. As for Jack, “he’s trying to be better,” said Sutherland. New cast additions include Cherry Jones, Jon Voight, Annie Wersching (who will play Jack’s new partner, a tough-as-nails FBI agent who could be perceived as a “female Jack Bauer”), Rhys Coiro, and Janeane Garofalo. 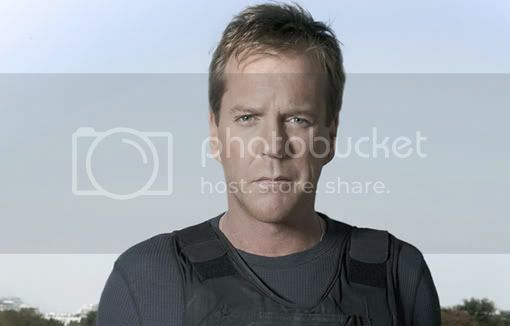 Audiences will see Jack Bauer have to answer for the torture he’s inflicted on several characters throughout the series’ run. David Fury says that they are never “endorsing torture” but are showing that Jack’s use of torture will have consequences. “It’s kind of necessary for people to get hurt,” said Fury about the series. So what’s going on with those rumours of a 24 feature film? Gordon says that the basic consensus is that “while the series is on the air, I don’t want to mess with a good thing,” but that a 24 feature will happen when the series wraps. It all sounds great. Still no news on the exact date when Day 7 returns to the British screen but it is being shown in America from January 11th 2009. Hopefully, Sky 1 will be showing the new series not far behind so we can experience Jack Bauer’s new stressful day. In a dramatic Brazilian Grand Prix, Lewis Hamilton has finally achieved his dream of winning the Formula One World Championship with a tense and exciting final few laps at Sao Paulo. Title rival Felipe Massa did the best he could by leading from start to finish in a rain-affected Brazilian Grand Prix, but race victory was still not enough as Hamilton was able to come home in fifth position… just! By winning the title, Lewis Hamilton becomes the youngest world champion in the history of Formula One motor racing. He also joins the list of great British drivers who have won the world championship including Mike Hawthorn, Graham Hill, Jim Clark, John Surtees, Jackie Stewart, James Hunt, Nigel Mansell and Damon Hill. It was McLaren’s first drivers’ title since Mika Hakkinen back in 1999 and the first for a British driver since Hill back in 1996. But in the final two laps to the chequered flag, with steady rain falling down, it could have gone wrong for Hamilton as he lost a vital track position when Sebastian Vettel passed him. At that point, the championship was heading towards Felipe Massa, and when the Ferrari took the chequered flag, everyone believed he did the impossible by winning the drivers’ title in style. But on the final lap as Lewis was desperately trying to pass the Toro Rosso of Vettel, Toyota’s Timo Glock – who was ahead and still running on dry Bridgestone on a slippery surface – was unable to stay on track and dropped down from fourth to sixth, handing the title to Hamilton. Ferrari still clinched the constructors’ title, with Massa winning the Brazilian Grand Prix and team-mate Kimi Raikkonen in third. Renault’s Fernando Alonso drove a solid race challenging the Ferraris and ended the season with a superb second position. The start was delayed by ten minutes after a brief, but heavy, downpour hitting the Interlagos track just before the mechanics were due to clear the grid. Although the sunshine returned within a few minutes, parts of the race track were damp. And deciding not to take risks, the twenty-car field opted to start the race on intermediates. As the five red lights went out, Massa headed into the Senna S still in the lead followed by Jarno Trulli, Kimi Raikkonen and Lewis Hamilton. Behind there was chaos as Nico Rosberg tapped David Coulthard into a spin, with the Red Bull Racing swiping Rosberg’s Williams team-mate Kazuki Nakajima. Coulthard was out on the spot and it was a sad and early end to his Formula One career. Renault’s Nelson Piquet Jr was also forced to retire in his home event in a separate first lap incident. The Safety Car made its appearance and stayed out for three laps while Coulthard’s car was retrieved from a dangerous position. When the field got going again, Massa edged away at the front as team-mate Raikkonen began to apply pressure on Toyota’s Trulli for second, with Hamilton running in a safe fourth. His McLaren team-mate Heikki Kovalainen lost out to both Vettel and Alonso in the opening lap as the Finn tried to protect Hamilton. Heikki did get past Fernando at the restart, only for the McLaren to run wide and losing the position again to the Renault. As the track began to dry out, some teams opted to gamble by running slick tyres. This worked beautifully for Giancarlo Fisichella as the Force India team pitted the Italian at the right moment thereby gaining track position. By the time the rest of the field made its switch to dry Bridgestones, Fisichella was up to fifth, in between Raikkonen and Trulli. Hamilton soon passed sixth-placed driver Trulli, when the Toyota slid wide into the Senna S, but it was not until lap 17 that he was back in the all-important top five race positions when he passes Fisichella at the same corner. The McLaren driver then gained an extra place when Vettel made an early second pit stop on lap 27. Although the Toro Rosso was temporary in second when the other cars made their final pit stops, Vettel’s final third visit to the pits for new tyres and fuel dropped him back to fifth behind Hamilton. 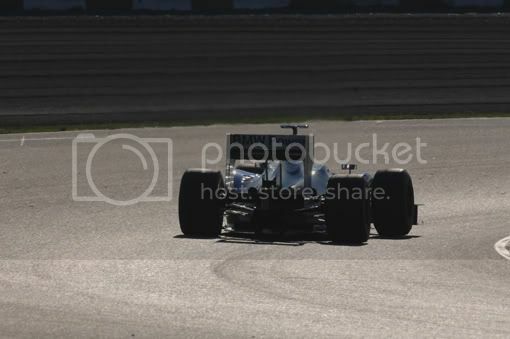 Meanwhile at the front, Massa was comfortably pulling away from Alonso and heading for the race victory. Ferrari team-mate Kimi Raikkonen was slowly closing in on Alonso, while Hamilton was still driving cautiously in fourth. But then the rain showers returned with only seven laps to the finish! Not taking any risks except for Toyota, everyone pitted for intermediates. By staying out on a wet track with slick tyres, Timo Glock moved into fourth, ahead of Hamilton and Vettel. It looked like title was still heading to Hamilton’s way until he ran wide at the final corner when BMW Sauber driver Robert Kubica decided to un-lap himself! That also let Vettel through and suddenly it appeared that the title had slipped from Hamilton once again. But within sight of the chequered flag, Hamilton’s luck changed as Glock was losing grip (as much as 17 seconds on the final lap alone!) 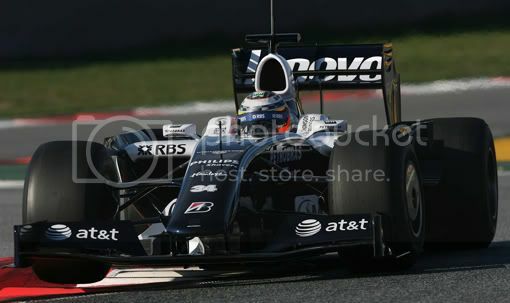 and it allowed the McLaren to sweep past and back into fifth position. By that time, the Ferrari team was celebrating Felipe Massa’s championship success, but the mood quickly changed as it became clear that it was Lewis Hamilton who won the title. Poor Massa. The young Brazilian believed he did the job with pole position and race victory. But to lose out by a single point, that is deeply distressing… Though Felipe should be proud of his achievements this season and he did put in a strong performance in the final race. Heikki Kovalainen finished seventh for McLaren while Jarno Trulli finished in the last point-scoring position with eighth for Toyota, ahead of Mark Webber’s Red Bull Racing and the BMW Sauber of Nick Heidfeld. So congratulations to Lewis Hamilton for winning the 2008 Formula One World Championship. The 23-year-old Briton had been dreaming this day would come since he drove for the Vodafone McLaren-Mercedes team back last year. Back in 2007, he missed out on the chance to become world champion when he was feeling the pressure from then team-mate Alonso and eventual winner Raikkonen. Fast-forward twelve months on, Lewis has finally accomplished his objective but he must be feeling pretty anxious in those final two laps in Brazil! 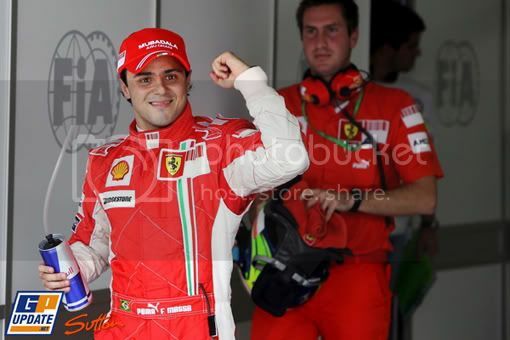 Hard luck Felipe Massa, but he will come back stronger and more determined than before in 2009. The Brazilian may not have won the world title, but by finishing first with team-mate Raikkonen third, the Scuderia Ferrari team have achieved their 16th constructors’ title. And so ends a dramatic and controversial season of Formula One racing. We have seen new winners, classic races and exciting moments in this sport and thanks to the talent of Lewis Carl Hamilton – we have a British world champion. After the success of Casino Royale, where Commander James Bond earned his ‘double-0’ status and the license to kill, the direct sequel to the 2006 hit film that is Quantum of Solace proves to be a big disappointment. The twenty-second Bond film from EON Productions, picks up almost an hour after the final scene in Casino Royale, where 007 is involved in a thrilling car chase. This action sequence seems to set the mood in Quantum of Solace with exciting chases, gun action and impressive stunts. Unfortunately, after this opening scene the film lacks the thrill and drama due to the poor pacing. It doesn’t help that the story continues from Casino Royale, where Bond is seeking revenge for the death of Vesper Lynd. Daniel Craig once again plays the British secret agent and his performance continues to impress. He could easily be ranked – along with Sean Connery – as the best portray of Ian Fleming’s spy. Though it is quite remarkable that the Bond character played by Craig has changed so much from Casino Royale to the Quantum of Solace. In the first film, he still had the charisma from the other previous Bonds but with a more gritty realistic side to the character. In the Quantum of Solace, it seems the writers just couldn’t decide if he’s motivated by revenge or seeking solitude. 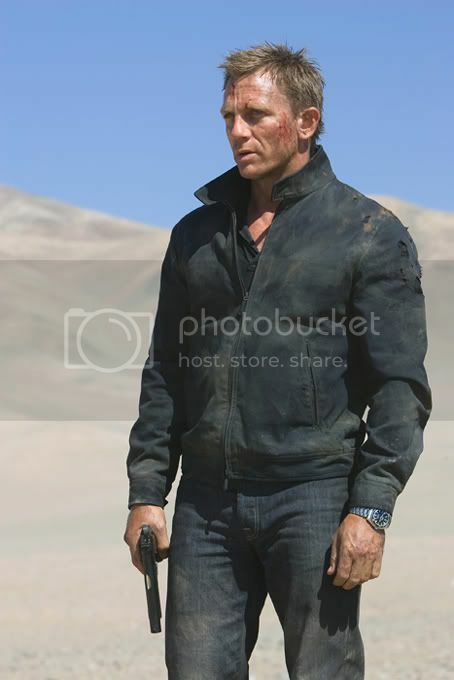 Craig’s second appearance reveals a more arrogant attitude that he becomes barely recognisable as Bond anymore… It seems he has became Jason Bourne and this is not surprising, as most of the action sequences feel likes it is taken from the Bourne films. Some of these scenes do look good with quick editing/camera work followed by brutal, devastatingly fistfights and chases. But this style of filming just doesn’t fit in the style of previous Bond films. I believe director Marc Foster, who was behind such acclaim hits with Finding Neverland and The Kite Runner, wanted to continue the gritty feel set by Casino Royale, but it fails to generate excitement. As for the supporting cast, Dame Judi Dench returns as M but she feels unease by Bond’s action as he travels around the world searching for answers behind the secret organisation known as Quantum. Dominic Greene, a member of this secret organisation, is played by the award-winning French actor Mathieu Amalric. Greene’s idea of taking control over Bolivia’s water supply can be seen as quite tame by evil villain standards but he remains a threat to 007. Olga Kurylenko plays Camille Montes, a Russian-Bolivian agent who also has a grudge against Greene and Quantum. When she and Bond meet, the chemistry is there and it certainly sizzles up on the big screen. Kurylenko is no typical Bond girl as she is capable of some action and was able to demonstrate this in some scenes with some brutal fighting sequences. As for Gemma Arterton, playing the role of MI6 agent Strawberry Fields, her cameo was quite brief and not that memorable unfortunately. In summary, the Quantum of Solace promises so much but fails to deliver in terms of drama and spectacle. With a running time of 106 minutes, this is the shortest Bond film in the series. I really hope James Bond returns in the next film back to his truth self and not a clone of Jason Bourne following this overhyped and disappointing film. Ferrari’s Felipe Massa scored his sixth career pole position in Sao Paulo while championship rival Lewis Hamilton will start in a disappointing fourth. By starting on pole position – his third successive pole – the Brazilian has a great opportunity to win the race in front of his adoring fans and possibly the world title. Toyota’s Jarno Trulli lines up in an impressive second, his best grid spot since the French Grand Prix back in 2005. Former world champion Kimi Raikkonen will start in third for Ferrari. The Italian team can actually win the constructors’ championship if Massa and Raikkonen score a strong result in Sao Paulo. For Lewis Hamilton, this qualifying result will be a big concern for his championship prospect. He needed to start at the front in order to win his first drivers’ title in style but with fourth position, Lewis will face a difficult Brazilian Grand Prix on race day. Yes, he can still win the championship by finishing in the top five, but Lewis must be feeling a little worried. His McLaren team-mate Heikki Kovalainen tried his best to upset the grid order as the Finn had a quick car around the Interlagos circuit, but when it mattered, Heikki could only manage fifth. As for Fernando Alonso, who again stated his claim in supporting Felipe and Ferrari in the title chase, the Renault driver will start in sixth. Scuderia Toro Rosso’s Sebastian Vettel will line up seventh on the grid with team-mate Sebastien Bourdais in ninth. Between the pair will be Nick Heidfeld in the BMW Sauber. And rounding out the top ten is Timo Glock in the second Toyota. Nelson Piquet Jr missed out on an opportunity to take part in Q3 by a small margin (0.03 seconds!) and will start in P11 for his home race. As for David Coulthard, who will be racing in his final Grand Prix with a special livery Red Bull car, the Scot will be two positions behind his team-mate Mark Webber in P14. Fellow race veteran Rubens Barrichello, who maybe out of his Honda seat at the end of the year, out-qualified his team-mate Jenson Button with P15. So the stage is set for a dramatic finale in this exciting and controversial season of Formula One motor racing. Lewis Hamilton heads the drivers’ standings with seven points over Felipe Massa, and yet it is the Brazilian who has the advantage on the race track. If Lewis wants to win the title, he needs to stay calm and run at the same pace as the cars ahead. The title will be his if Hamilton finishes inside the top five. For Felipe, pole position is ideal, so all he needs to do next is go for the maximum ten points with race victory. And hope something unfortunate will prevail his title rival in not scoring any points! Sunday’s Brazilian Grand Prix could yet be a wet race so it will be fascinating who will be fast and composed enough to win the championship. Will it be Lewis Hamilton or Felipe Massa? Let the showdown between the two commence on race day!